My art is a response to the beauty and intricacy of the world around me. It is a reflection of my faith in the Creator of this world. I want the pieces I create to be an honest expression of who I am as an artist and a woman. I hope that when I am able to achieve that result, the viewer finds that the painting speaks to them personally. They make a connection that is meaningful to them and that touches their soul. That is the joy of painting for me. In the past I have taken courses at Montserrat College of Art and have studied with many gifted and renowned artists from the North Shore and beyond. I work in oil, adding cold wax and marble dust to create layers of texture. I also work in pastel, acrylic, mixed media, and monotype printing. I am an artist member of the North Shore Arts Association, the Rockport Art Association and Museum, and a member of the Experimental Group of RAA. 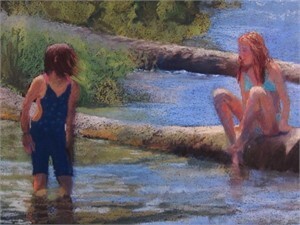 I am also an artist member of the National Association Of Women Artists, and of its Massachusetts chapter. In addition I have also exhibited work with the Newburyport Art Association, Marblehead Art Association, Endicott College, the Harlem School of the Arts, Front Porch Gallery of Wellfleet, and the pastel societies of both New Hampshire and Cape Cod. My paintings are in private and corporate collections in the U.S and abroad. Carmela Martin My art is a response to the beauty and intricacy of the world around me. It is a reflection of my faith in the Creator of this world. I want the pieces I create to be an honest expression of who I am as an artist and a woman. I hope that when I am able to achieve that result, the viewer finds that the painting speaks to them personally. They make a connection that is meaningful to them and that touches their soul. That is the joy of painting for me. In the past I have taken courses at Montserrat College of Art and have studied with many gifted and renowned artists from the North Shore and beyond. I work in oil, adding cold wax and marble dust to create layers of texture. I also work in pastel, acrylic, mixed media, and monotype printing. I am an artist member of the North Shore Arts Association, the Rockport Art Association and Museum, and a member of the Experimental Group of RAA. I am also an artist member of the National Association Of Women Artists, and of its Massachusetts chapter. In addition I have also exhibited work with the Newburyport Art Association, Marblehead Art Association, Endicott College, the Harlem School of the Arts, Front Porch Gallery of Wellfleet, and the pastel societies of both New Hampshire and Cape Cod. My paintings are in private and corporate collections in the U.S and abroad.